Whole Wheat Dough: Must or Bust? The first pizza related post I made on this blog gave the dough and sauce recipes that I had developed over a matter of months of experimenting. I had found a sort of all-purpose dough for making both cracker crust and a “normal” pizza with a crispy crust but some chewiness as well. 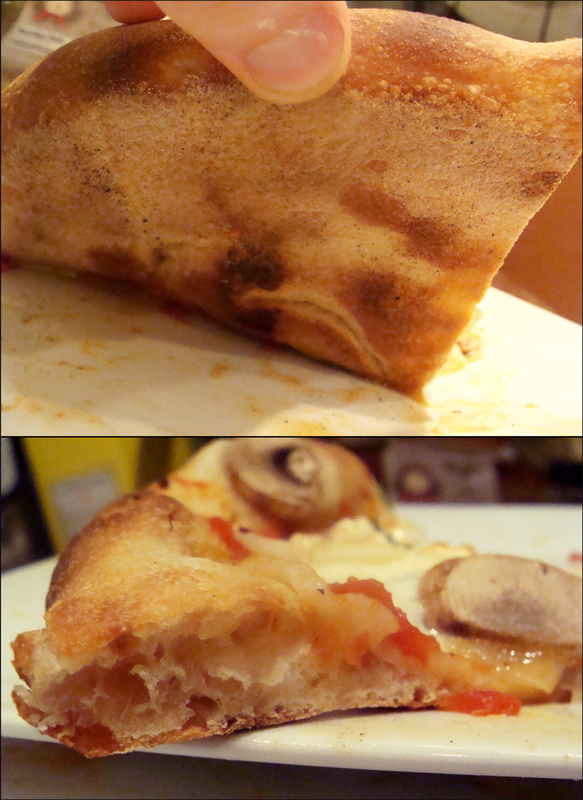 Basically the only difference between these two styles was the amount of dough I used. I then started experimenting with baking surfaces and quite suddenly abandoned my dough and sauce recipes in favor of recipes influenced by The Pizza Lab. The recipe I started favoring included no whole wheat flour or spices, but delivered improved crispiness, chewiness, and flavor. Why would anyone want to look back in light of such progress? Well, I happen to still like my old recipes. I like that whole wheat is more nutritious, and I like being able to make a cracker crust, which I somewhat doubt could be done with this dough (even if I made a thin crust pizza, the dough would still have too much spring in the oven to produce a dense cracker crust). Also, I’m an experimentalist at heart. The doughs were prepared using different proportions of whole wheat and bread flour. These flours don’t produce the same dough consistency at the same level of hydration, so hydration also varied. I made a 100% whole wheat dough (71% hydration, i.e. 3.9 oz water), a 50% whole wheat dough (69% hydration), a 25% whole wheat dough (65% hydration, and a 100% bread flour dough (65% hydration). Being a good experimentalist, I must also own up to important variables that were poorly controlled or not controlled. The yeast sat at room temperature exposed to air while I was making all the doughs, which may not matter, but certainly would bother me if I were making beer. The bread flour dough had a little less yeast added, for the simple fact that I ran out. I did not have a process for ensuring that each dough received an equivalent amount of kneading (either controlled by time or gluten development – although I tried to get all the doughs to pass the windowpane test). Most critically, the pizzas were baked one after another on the same stone without significant time for reheating, again in order of decreasing whole wheat content. When I removed the dough tonight for proofing, all the doughs had risen to about the same height, with no significant difference discernable among them. 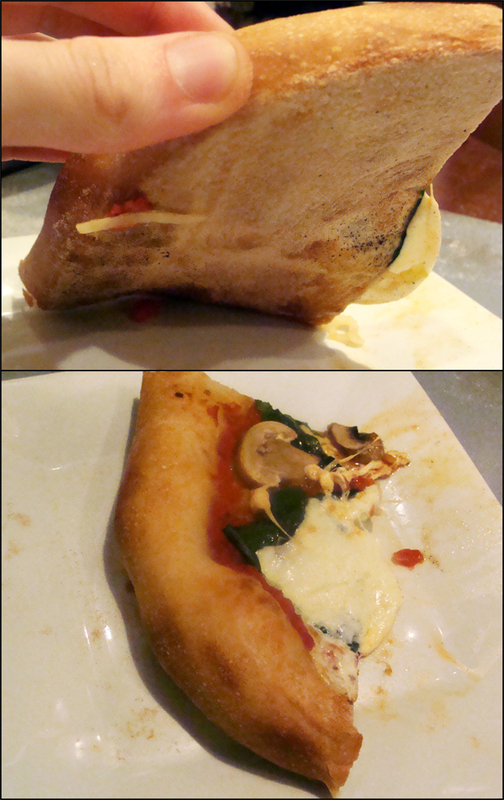 The texture of each dough was, however, noticeably different. The bread flour produced a dough that was easily stretched, and had almost a creamy or fluffy appearance to the top. The whole wheat flour in contrast was not nearly as elastic and almost looked like peanut butter on top, only a bit more rough than the bread flour but with a denser appearance. However, the hole structure visible through the side of the containers was indistinguishable. I unfortunately don’t have pictures of the dough at this stage. After proofing for a couple of hours, each dough ball handled pretty similarly. Some of the doughs with more bread flour and less whole wheat flour tore, but this was likely do my own clumsiness, and it’s easy to just stretch the dough around it a bit and fold it over to fill in the rip. My stone didn’t smoke and the pizzas didn’t have any holes in them so there seemed to be no problem with the rips. So let’s get on to the pizzas. This is my first entirely whole wheat pie, but I can’t say I’m inspired to revisit this experiment. Crust uniformly brown, top and bottom, lacking crispiness and chewiness. The entirely whole wheat pie came out seeming like it was undercooked, despite the fact that the toppings had all thoroughly cooked and there was no uncooked portion of the dough. The crust was uniformly light brown, but was squishy like a loaf of bread. 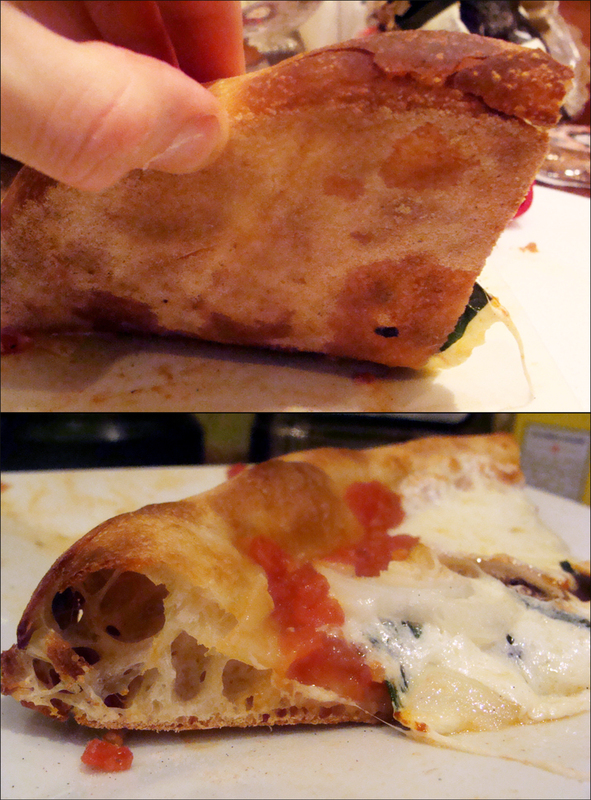 The outside of the crust was indistinguishable from the inside of the crust, and the slices had no rigidity to them. Unsurprisingly the crust has a dense crumb and looks very similar to a whole wheat loaf. The qualities of this first pizza immediately put my suspicion that the whole wheat flour was critical to my cracker crust into doubt. Not only did the whole wheat dough fail to crisp up, but it wasn’t chewy either, rather soft and bready. Whole wheat flour seems to be a bust. 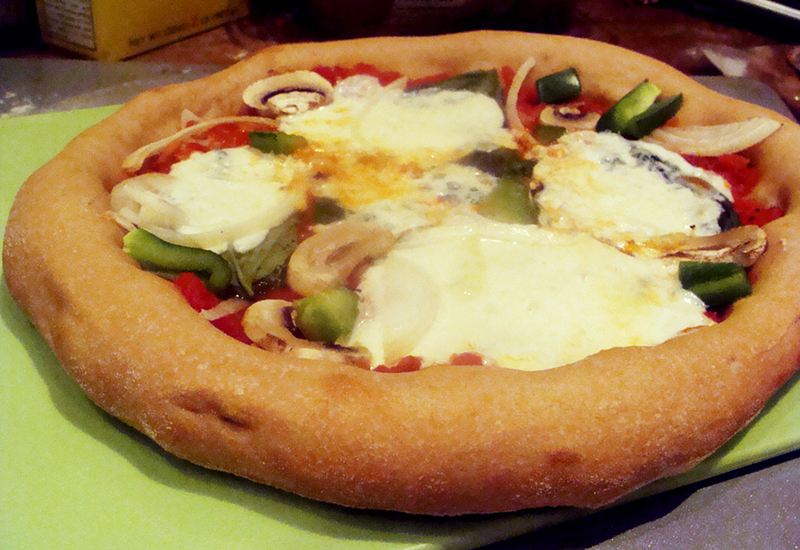 The pizzas improved each time, in spite of the cooling stone. There’s not much more to say that the pictures don’t show. It seems clear that the whole wheat flour impeded oven spring effects, despite all of the doughs stretching similarly on the make surface. However, the flour affected more than just oven spring, as the whole wheat flour never toughened into a crisp shell or a truly chewy crust. Why the flour acts so radically different from bread flour is beyond my knowledge. At a 1:1 ratio of bread flour to whole wheat flour, the crust already starts acting differently from an entirely whole wheat crust. This pizza was not as good as an all bread flour pizza, but at least the crust now shows some variation in coloration, and had a small amount of crispness to it. By the time I got to the dough made of one quarter whole wheat flour and three quarters bread flour, the crusts started getting good. One can even see some variation in the coloring under the pizza on these slices, especially around that wicked scar (that’s where I healed a tear in the dough). The crust was getting nice and crispy, and the hole structure more open and polydisperse. Rather than densely bready on the interior, the crust was chewy. 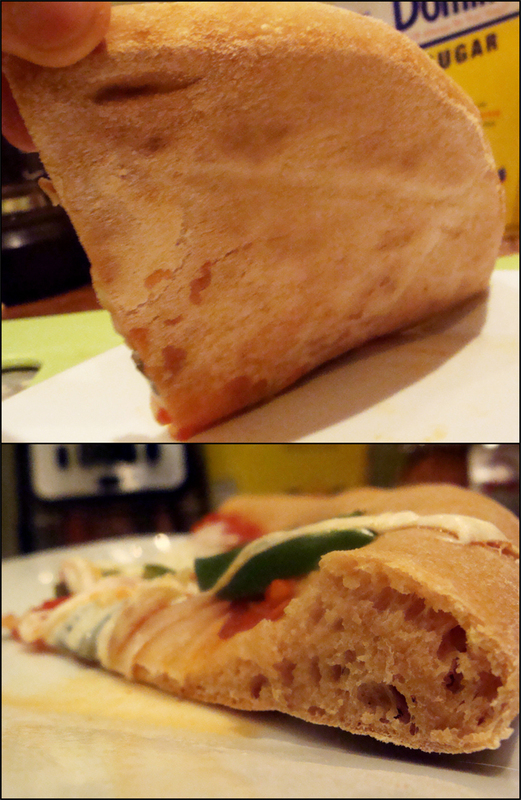 And of course best of all was the purely bread flour pizza. Even though the one-quarter whole wheat pizza was close, it hardly seems worth using such a small amount of whole wheat flour in the name of health benefits when it so negatively affects the quality of the crust. Below is the entirely bread flour pizza in all its glory. Verdict – don’t bother with the whole wheat. I’ll see how the cracker crust comes out without it. Based on the results of this test, I’m guessing the cracker crusts I was making were more a result of the technique (docking the dough and doing a slow bake) than the dough recipe. This entry was posted in experiment, pizza and tagged dough, flour, whole wheat on March 7, 2013 by Dylan Bargteil.